Last Sunday, we celebrated a crafty friend’s baby girl’s 3rd birthday. I decided to use the remnants of my Ikea ‘mini-bolt’ to wrap up this gift, so that the mummy can have some fun making her little girl stuffs too! 1) The present was first wrapped up with kraft paper first. Then I was deciding if I should use safety pins to pin the folds in place or fabric glue, or a ribbon to tie it all up?! Then DH had a brilliant idea for my to sew everything in place! 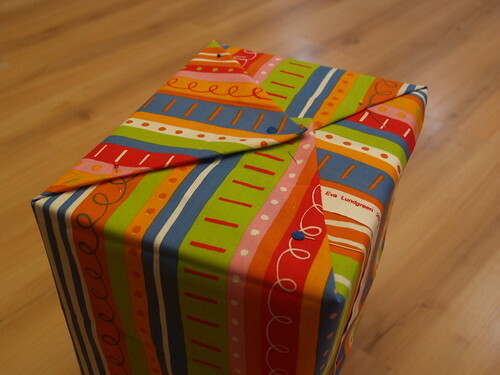 2) So, I ‘wrapped’ up the present as you would with your gift wrap paper. 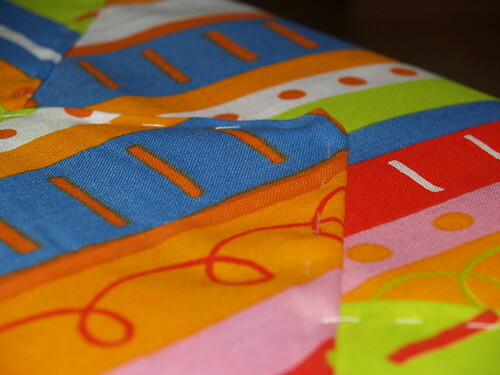 And pin and pin and pin the fabric into position. 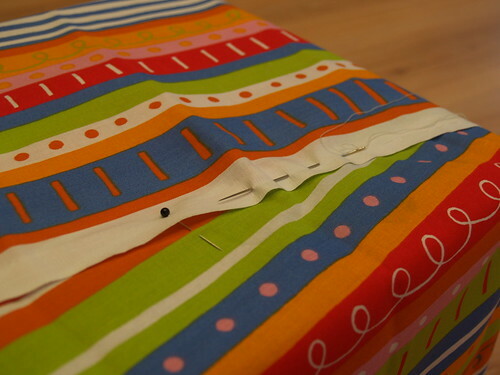 3) Using a darning needle or similar, run your stitches along the edge of your fabric. Make sure you catch the bottom fabric! This is where the initial brown paper comes into play. The brown paper prevents ‘injury’ to the box when I stabbed too hard through the fabrics, etc. As for the thread, I just use a single strand of polyester-cotton thread to sew this baby. No need to use strong threads as I wanted the gift recipient to be able to rip out the threads easily, and not damage the fabric! How creative! Thanks for the idea. I’m thinking of how wonderful Christmas would look with a bunch of these under the tree.